While not the most pleasant conversation topic, cat constipation home remedies are something every feline owner needs to know about. 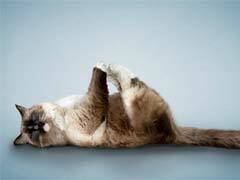 Constipation is a fairly common problem for cats, especially if they eat hard food primarily. Learning how to recognize and solve the problem are important to keeping your cat healthy and regular. The most obvious sign your cat is in need of cat constipation home remedies is by what shows up (or what doesn’t show up) in the litter box. Cat constipation symptoms include a noticeable reduction in the number of bowel movements done by your pet. Generally, cats defecate once per day but if they are going less than once every 2 to 5 days they probably have a problem. Also, some owners are surprised that diarrhea can be a symptom. When the blockage takes up so much room in the colon, the watery stool is all that can be passed out of the body thus giving the appearance of diarrhea. You should first talk to your vet about options for cat constipation treatment. The vet will need to determine the severity of the blockage. In most cases, increased hydration and possibly an enema can do the trick. In more severe cases, your cat will need to have the built-up feces manually removed while he is under anesthetic. Once the condition is cleared up you can start cat constipation home remedies, such as switching to wet food, feeding your cat small amounts of petroleum jelly daily (to lubricate the color and intestines for easier stool passing), and using a water fountain instead of a bowl. If these cat constipation remedies don’t completely alleviate the problem, you can also add powdered slippery elm bark into their wet food to give them some additional fiber or begin giving them daily doses of Miralax. Even though no cat constipation cure is full-proof, making sure they stay hydrated and switching away from dry food can make a huge difference. You can also try the other cat constipation home remedies.